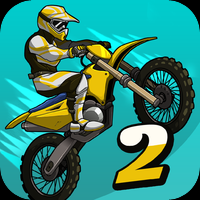 Mad Skills Motocross 2 This game is only available on the mobile platforms above. Mad Skills is back with a brand-new addiction! Mad Skills Motocross 2 features the best motorcycle physics of any side-scrolling racing game on the planet. Play through dozens of tracks and compete in new challenges every week! All games and trademarks are copyright their respective owners. Contact Us if you feel Mad Skills Motocross 2 has been used without proper permission.